As always Recently, I’ve been thinking of Paris. Just before I left for the City of Light last April, I happened to meet a woman walking through a store in Baltimore, similarly dreaming of the possibilities that could exist there. “I’m redecorating my bedroom with a Parisian theme,” she told me, and I remember feeling a sense of – Oh! I should do that. When she continued on, to tell me that she’d never been there but was saving for the Trip of a Lifetime, I felt guilty; after all, I’d already visited three times, to the point where the novelty of tourism had worn off, and was on the cusp of adventuring as a temporary ex-pat, renting an apartment in an off-beat section of the city. 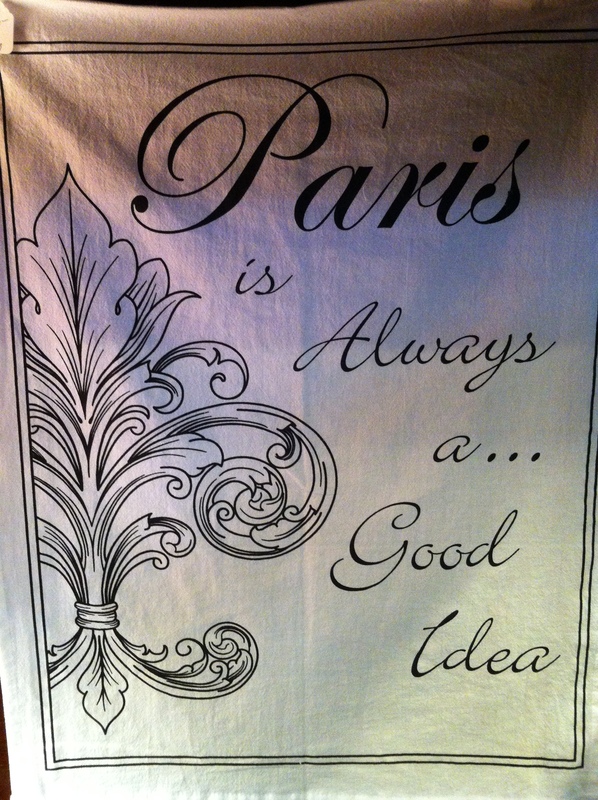 As she bought a dishtowel scribbled with words from a movie, I wondered if – in fact – the woman in the shop deserved to travel to Paris more than I did. I don’t disagree with Sabrina on this one. I’ve written extensively on this blog about that month in Paris, so much so that I feel self-conscious about it. It wasn’t that big of a jump for many people I meet; I know many who have engaged in travels far braver than my brief sojourn to such a familiar, Western place, and the number of blogs that deal with far more exotic locales dwarf this little space I’ve created. But what can I say? 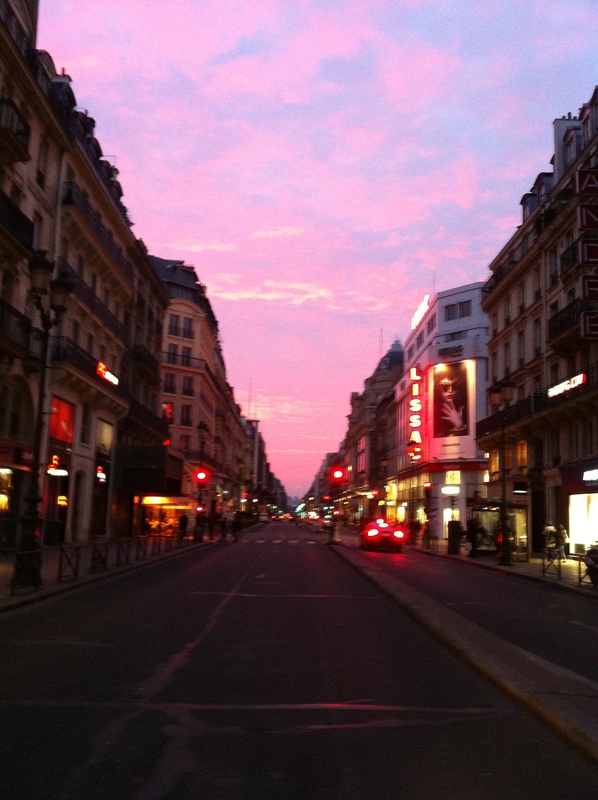 Paris was my dream – one of them, at least, one of many – and it came true. Yet rather than “curing” me of the wanderlust associated with that city of love, my time there only deepened my affection. 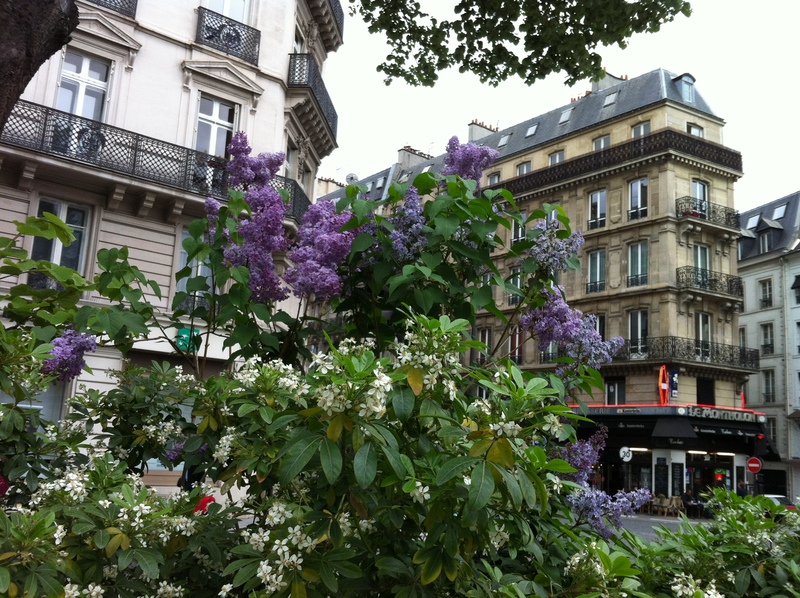 A roadside explosion of flowers, under the watch of Parisian buildings. Lately, though, I’ve wondered if it’s just my doing, or if my intoxication with Paris has come, at least partly, through something else. 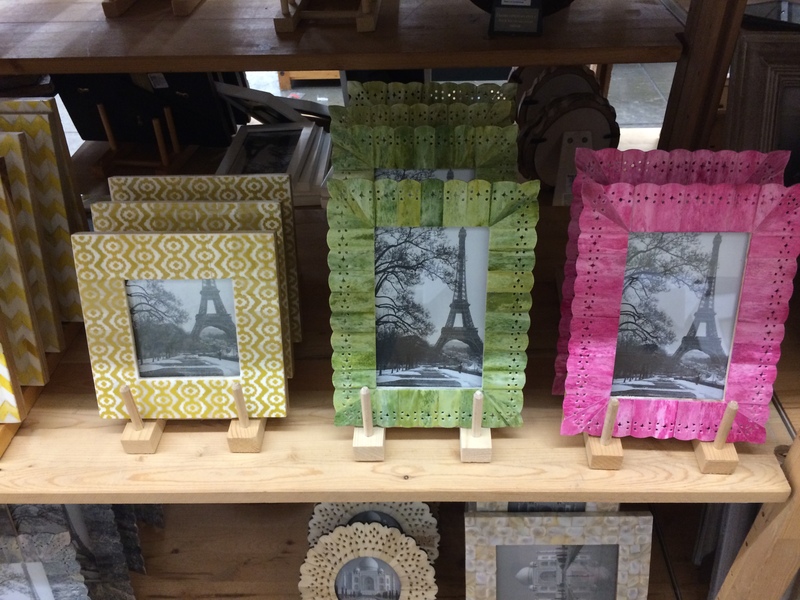 Strolling through a store the other day, I noticed the number of references to Paris. Books placed neatly on display imbibed the entire shop with a desire for a dance with the city, crying out for the mystery that can exist only when someone mutters, softly, the notions of crepes, espresso, the Seine. But this is the problem: I will never be Parisian, wherever I am. I strolled a bit further through the too-expensive dresses and earrings, and came upon the housewares section, which always sets me aback. Who can afford such things? 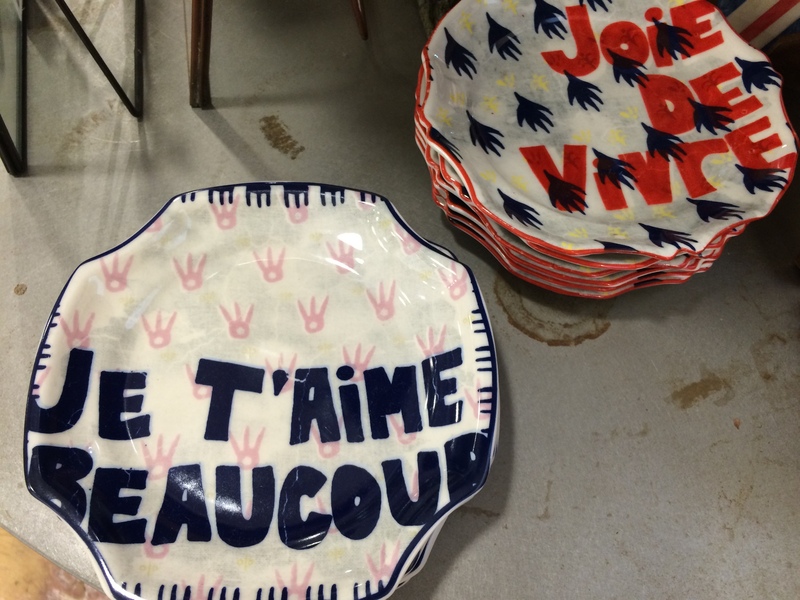 But I almost made an exception, when I spotted the beloved language itself adorning decorative plates. It turns out that it wasn’t just that single shop, though. 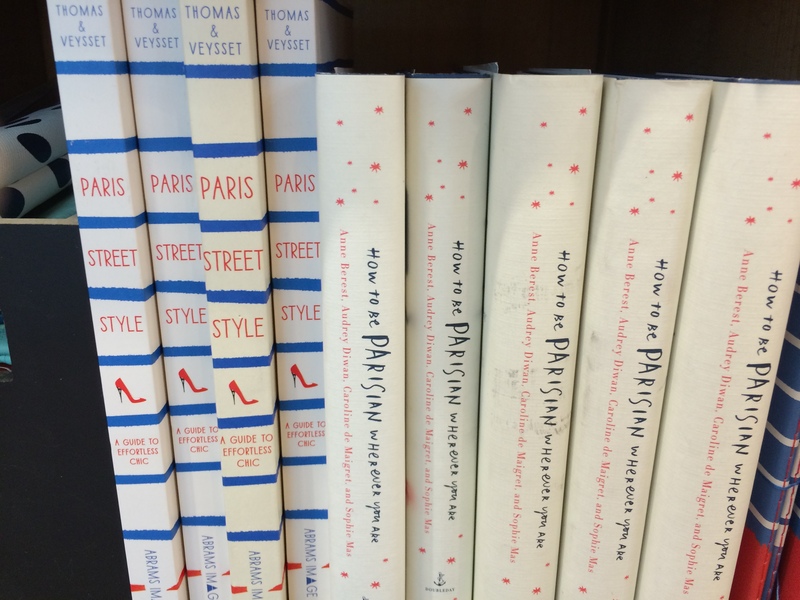 I started noticing when Paris-as-marketing came across the radar, and let me just say that it was hardly infrequent. In card stores, shoe stores, and stores that sold only magazines and souvenirs, the message started reaching out and grabbing me: Paris. Paris. Paris. No need to remove the images included within. It’s powerful marketing, the romance of a city so far away, where the food is delicious and accessible, where the people are aloof and enticing. I imagine even the account managers for advertising agencies around a large table, eating poor imitations for what a real croissant can be, transported to their own fantasies in the shadow of la tour Eiffel. 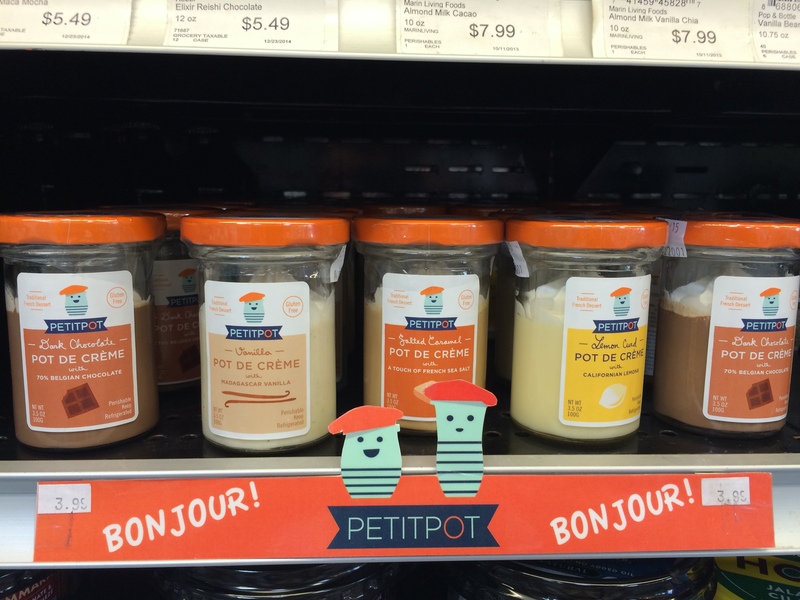 Who among us doesn’t want an adorable petit pot? And perhaps this is where it is appropriate to admit that on a near-daily basis, I imagine myself taking residence in my favorite city, bumbling my way through until I am finally fluent, adopting an air of chic untouchability in the process, standing at a tall table, casual café crème in hand, baguette slung over my shoulder, comfort in my own body running down my limbs like a pair of finely-cut snakeskin pants. Perhaps this is the moment when I admit that I’ve been dreaming of this particular alternate reality since I was 21, when I tried for the first time, in real time, to figure out the difference between the Left Bank and the Right Bank as I was standing, surely, on one or the other. Long before I set foot in the city, I imagined exactly this scene (though in my imagination, I might have worn a beret). In that life, I am not glamorous or rich; I am merely myself, only somehow more at ease, in a colorful bohemian apartment far from the city center. 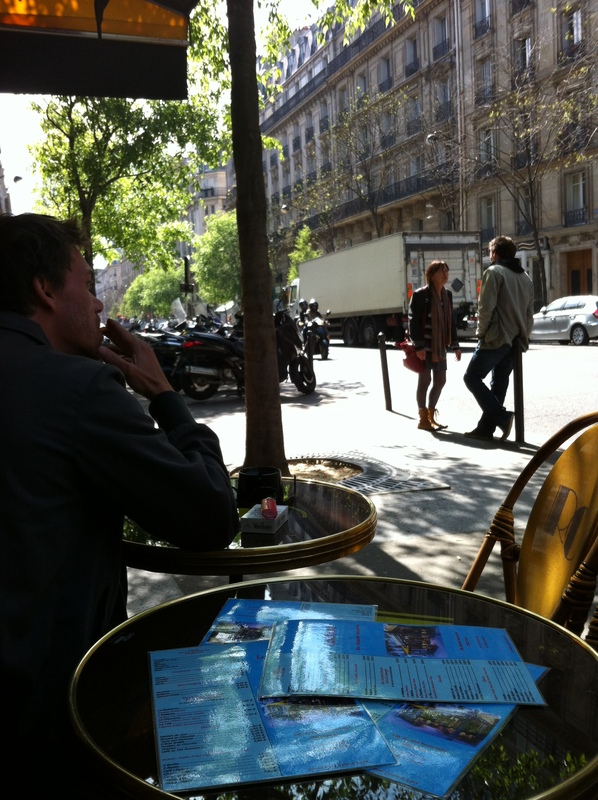 I actually think that last year, in Paris, I received a glimpse of that life: that might have been how it was for me. 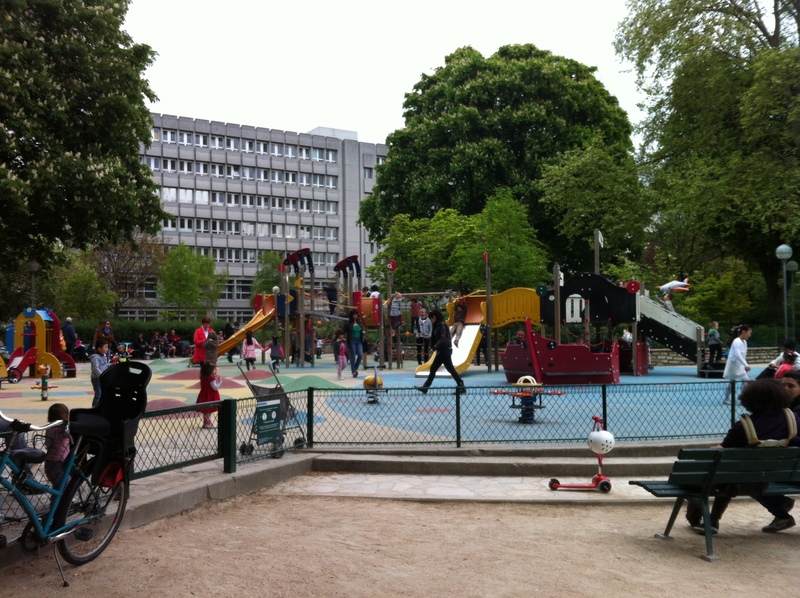 Perhaps my children would have played at this very playground, hidden among the streets of Paris. So when I stroll through stores trying to sell things that are somehow marked as Parisian though they were mass-produced in China, something inside of me revolts. 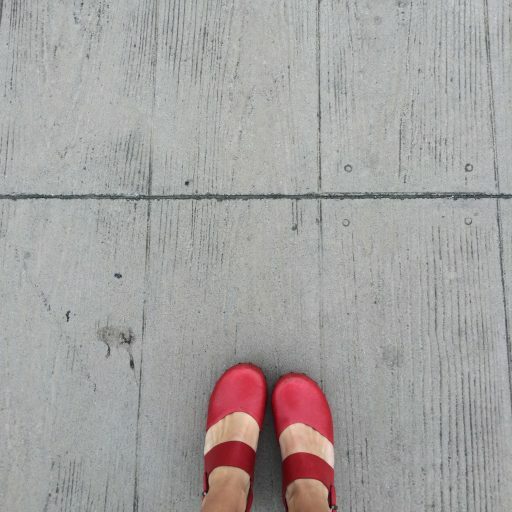 It’s not Parisian, to think of blending in, when the very sense of the city is about individuality. 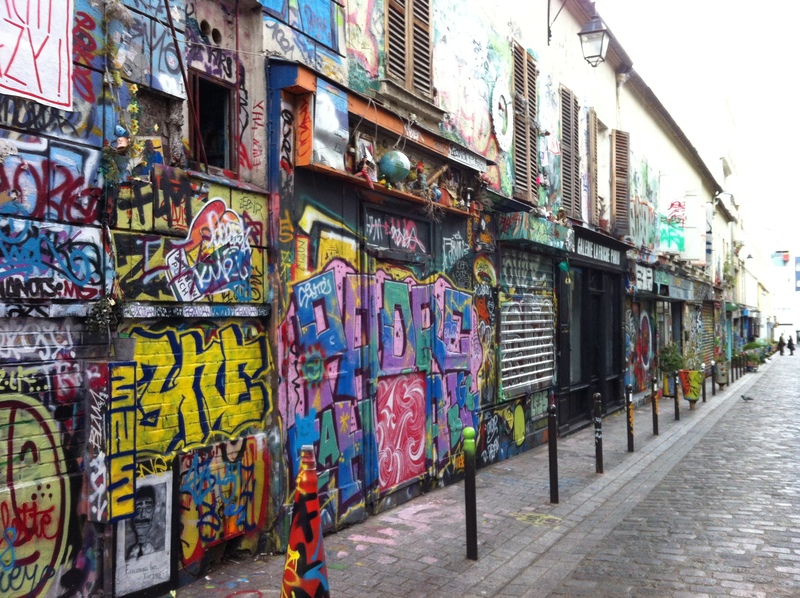 Here is the Paris I imagined: thick with art, bold in statement, even among those inclined towards graffiti. This is Paris, I want to say. And this. And this. And this. It’s a city alive with color and tradition, and it cannot be bottled, sold, labeled, or traded. It’s tailored gardens and bouquets of fresh flowers; the quintessential aromas of chocolate and coffee; the slow swallow of wine and the long hours of lunch. It’s music and horns and silence, too, tucked into unexpected corners of the city, and young families and old ladies and hipster kids on their headphones as la Métro races towards the next stop. 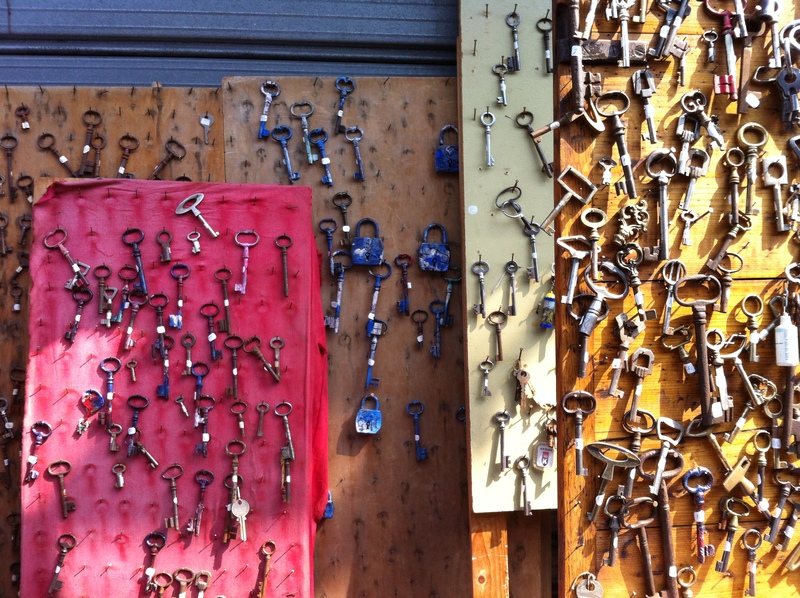 Keys to any number of secrets hidden throughout the city. It is, somehow, a bit of everything, alternately sauntering and pulsating so vividly right in front of me that I cannot bear to look anywhere else. 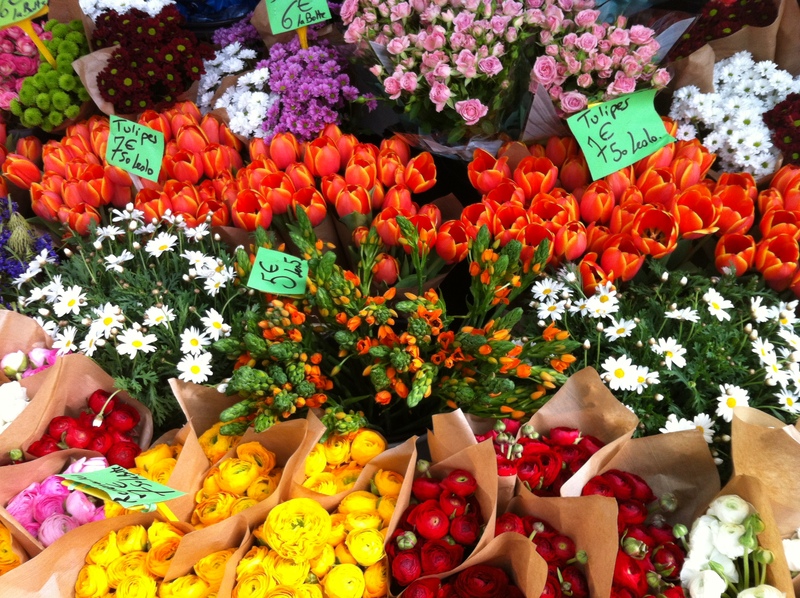 My version of Paris is full of bouquets. As I write, I glance at the upper left of the window in front of me, where a small model of a hot-air balloon hangs from a cord. I remind myself: I did not just dream of Paris. I lived it. Even if it was only for a month, I went beyond the dishtowel sayings and the card-store wares to discover the city as it exists for me. I hope that before too long, I return, finding myself again with a bit more at ease, in a city filled with not only light but also magic. Bidding au revoir to the day, welcoming la nuit. For those still dreaming, like the woman from Baltimore with the Parisian bedroom, I can’t promise anything about what it will be like for you. But I will say this: however you get there, whenever you get there, that city holds the capacity to wrap you up, to completely take you in, to both irrevocably charm your senses and perhaps even take away your common sense. Perhaps, in truth, I have fallen for the image constructed by brilliant advertisers. I’m not above that. But Paris goes beyond that for me. On some level, I’m still waiting for it to let me go – even as I hope it never does. This entry was posted in Paris. Tagged advertising, French, marketing, memories, Paris is always a good idea. Previous Post Previous post: Winning! A beautiful piece…makes me want to go there!